Property Love…Learn why its important to love your property in sickness and health! Lenders, the guys and gals who lend you money care about the health of your property and so should you because if you take care/love your property it will love you back with income! Check out this video and national article published last month below for more info! Professor Real Estate® Suzanne Hollander teaches you to love/take care of your property in its sickness and health. This is important because lenders, the guys and gals who give you the money, like healthy properties so if your property is sick with a property flu like a flood, loss of tenants etc, lenders want to see a plan to get it back on track, healthy and income producing! 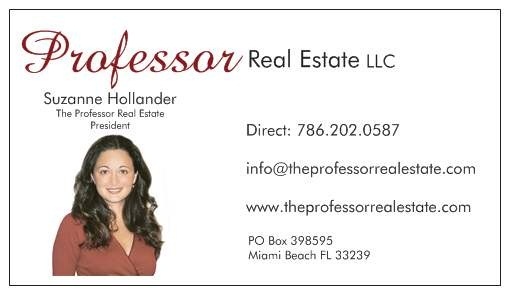 Contact me Professor Real Estate® for real estate lessons that will help you make smarter decisions, for real estate and motivational speaking engagements and consulting! « Get Your Property Tax Discount! Pay in November to $ave! > Buying Real Property > Property Love: Love Your Property & It Will Love U and Your Lender Back: National Article!